InText works to help advertisers find the most lucrative method for advertising online to create a successful and high converting ad campaign. 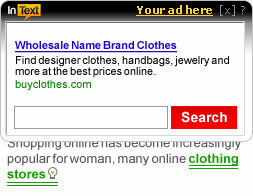 The five high-impact ad units offered from InText are available with or without display ad images. With an advanced ad optimizer, the InText system will determine which ad will work best for your company to maximize ROI. 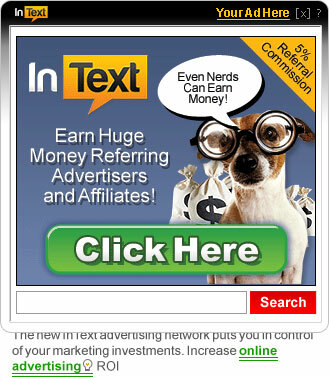 InText is the perfect complement to AdSense as it does not break Google's terms as a competing alternative. 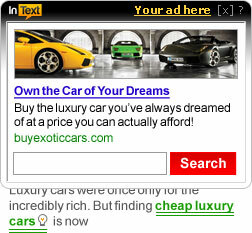 Start advertising with InText today and start earning more money with a lower cost per click (CPC). 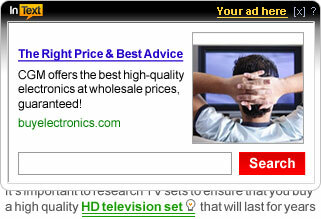 The standard Text Ad format is the basic and most standard InText ad unit if no image is uploaded. It's highly effective and a great way to promote your business or product. 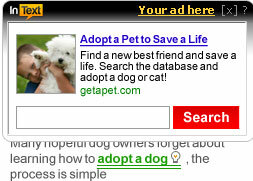 The highly versatile text and image ad unit merges an eye-catching graphic with high impact call-to-action text. Engage users and increase CTR for a dramatic jump in sales and ROI. The large text and image ad is a very successful and extremely high converting ad unit. Give your sales a boost with this ad unit. Attractive and effective, the deluxe billboard ad from InText engages users by providing a rich media image. Billboard ads successfully increase consumer impact through higher exposure and brand engagement. Increase brand awareness and brand recognition with the best performing display ad unit from InText. The eye-catching image box grabs a customer's attention and holds it, resulting in improved advertiser revenue and click-through-rate. InText ads all offer complete color customization options. Choose from over 12 custom themes and color options to make your advertisements stand out from the competition.